Making both a bold and simple move, Ford's North American boss Mark Fields confirmed this morning what we already knew, that the Taurus and Sable brands will be resurrected for 2008. Fields, delivering the keynote address at the Chicago Auto Show this morning, said the Ford Five Hundred nameplate will be dropped in favor of the venerable Taurus badge. The Freestyle crossover vehicle will also be renamed the Taurus X, and Mercury Montego will switch to the Sable nameplate. All three vehicle will be introduced to the press later in the day, though we were first introduced to the new "Taurus" in Detroit. Fields said only four in 10 consumers were aware that Ford offered a vehicle called the Five Hundred. Yet the Taurus nameplate, which was killed last year, had built up 20 years of strong brand recognition and was recognized by 80 percent of shoppers. Fields also said Taurus was Ford's third-best-known brand behind F-Series and Mustang. During the early '90s, the Taurus was America's best-selling car five years running. About seven million Taurus models were sold in 21 years, and Ford estimates nearly 3.5 million are still on the road. Check out more of our thoughts, a complete transcript of Mark Fields' speech, and VIDEO of him delivering the announcement after the jump. Acknowledging that simple demographics no longer work in developing business models, Fields said winning companies today are creating products that are relevant to all age groups. Simplexity, one of marketing's newest buzz words, will be another movement that successful companies embrace. Basically, Fields says Ford must offer more products with more features but present the package to the consumer in a simpler manner. He cited the Apple iPod as an excellent example of a product that is simple yet crosses over different age groups, and he noted that Starbucks offers up to 87,000 different combinations of coffee. "But all the customers care about is that they can get coffee exactly the way they want it," said Fields. "To grow and prosper in today's environment, like Starbucks, we have to reconcile more products -- with more features and more complexity -- but present them to the consumer in a simpler manner." Recognizing that Mazda has grown into a company "that knows exactly what its brand is all about," Fields says his job is to lead Ford to a similar transformation. Taking a vehicle like the Ford Five Hundred, which is a "Recommended Buy" from Consumer Reports, and giving it a recognizable name will help Ford pass the "simplexity" test. 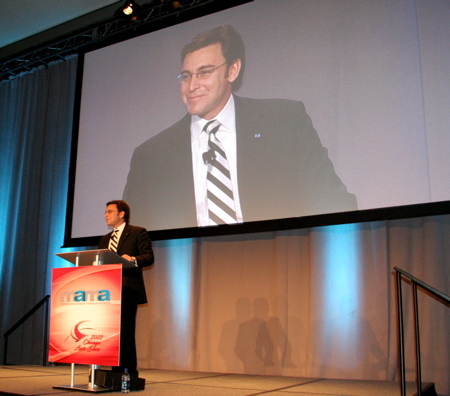 Following is a transcript of remarks as prepared for delivery by Mark Fields, Ford's president of The Americas, on Wednesday, Feb. 7, 2007, during the Midwest Automotive Media Association breakfast to kick off the Chicago Auto Show. It's great to be back in Chicago, and it's an honor to be asked by the Midwest Automotive Media Association to kick off what is truly one of the premier global auto shows. Chicago 's love affair with the automobile began at this show in 1901. In that time, this city has grown and prospered, and this show has become the most popular in the country with the people who matter most – the consumers. A great deal of the credit for that success certainly goes to the Chicago Automobile Trade Association and all of the dealers who serve on its board, including five Ford Motor Company dealers. I think all of these leaders deserve a round of applause for their hard work. I once read that the poet Carl Sandburg called Chicago, among other things, the "tool maker and hog butcher to the nation." Well, I think he would be amazed how this city has transformed itself since its early days. Today, Chicago is a role model for diversification, and it is home to United Airlines, Sears, Motorola, Boeing and, of course, a Ford assembly plant that's a model of flexible manufacturing. Key to Chicago's lasting success has been its ability to absorb every cutting-edge trend in America and adapt with the people who live and visit here. And it's not so different for us, particularly us at Ford. You've heard Alan Mulally and me talk about delivering more products that people want. It's our guiding principle within Ford today, and it's the way we're dealing with a hyper competitive and fragmented market like we've never seen before. I'd like to expand on what's behind this philosophy this morning and relate it back to every one of our businesses. I'll also touch on the fact that, as we introduce more products that people want, we also need to be very conscious of the strain it's creating in people's lives today. The cultural gurus call it "simplexity" – to describe the state that exists when something is both simple and complex at the same time. Consumers are begging us for help in navigating through the dizzying pace of technological change and informational overload. The solution, which I will touch on, is to refocus our attention on even stronger brands with a clearer and more consistent message to simplify life for our customers. In fact, it's the reason we at Ford are announcing another bold move regarding our own brands and products later this morning, and I'll touch on that a bit later. First, let's start with a simple question that I've been asking for years inside and outside of Ford: "Do we really know our customers?" "And do we really appreciate the phenomenal change occurring within their lives?" A lot of us will nod, because we're supposed to be the experts. But I would challenge you. Any company still basing its business model on simple demographics, quite frankly, is going to be left behind. The reality is that consumers today don't identify themselves "simply" anymore. They live complex lives, and they identify themselves in more than one simple role. And, in many ways, this simplexity is the reason we're seeing fragmentation within our industry and many others. And it's what's driving us toward more products that serve multiple needs. I said that we can't base our business models on simple demographics anymore. And that's true. What we need to focus on is digging deeper. Let's consider two shifts occurring within our country today – two shifts having a massive impact on the future of the auto industry. First, the Baby Boomers are aging. But, even as their physical needs are changing, their buying power remains massive. Today, Baby Boomers and those older account for 70 percent of new car purchases. And we expect that number to remain sizeable – at about 60 percent – through the end of the decade. We've relied on the Boomers to fuel growth of minivans and SUVs as they raised their families – and our fortunes. But, today, we're learning to adapt quickly as they downsize and change their lives and their vehicles – turning to crossovers and other smaller, more fuel-efficient vehicles in record numbers. At the same time, in less than 10 years, the Millennials will account for a quarter of all new vehicle purchases. It's no secret that our success also rests in the hands of these young people born between 1977 and 1998. Are we ready to deal with both groups at the same time? Do we really understand what's driving them? Or are we resorting to simple demographics and, perhaps, naïve thinking about the products that people really want going forward? I would suggest that the most profound shifts are occurring in mindsets, not age groups. Consider this: The University of Michigan reports that teenagers today spend an average of one full day each month online. About half of them sent or received a text message today. Half no longer feel the need to remember telephone numbers. And one in four says they no longer need to learn how to read a map. Well, before you answer, consider the fact their grandparents, the Baby Boomers, are displaying many of the same habits. In reality, Boomers want similar things as Millennials, and that includes styling that appeals to them on an emotional level, features that fit their lives and simplicity in the way we speak to them. Winning companies are figuring out ways to create products that are relevant to all age groups. The Apple iPod is certainly a clear example of a product crossing the age lines with both style, functionality and a simple user interface. And we are starting to figure out how to do this in the auto industry. Take Ford Sync. This in-car communications and entertainment platform we created with Microsoft is a great example of blurring the lines and creating a product that fits everyone's needs. Ford Sync will essentially put your cell phone and MP3 player on steroids, and it's creating a broader market for the very diverse Ford and Lincoln Mercury products that get this new feature exclusively this fall by appealing to a wider variety of customers. Quite simply, the Ford Sync is one of our best examples yet of delivering "more products that people want," while addressing the challenge of simplexity in the marketplace today. Which leads me to my second point on this very issue itself. I was interested to read recently a comment from the CEO of Phillips Electronics, who said that, with all of the new choices in the market, with all of these "more products that people want," consumers are getting tired. They're getting tired of not being able to record a program on TV. They're getting tired of spending hours reading instruction manuals. They're getting tired of complexity for its own sake. Now, don't get me wrong. We can't avoid the reality that complexity is the way of the future. It's the nature of our business and many others. Back east where I'm from, if you wanted a cup of coffee on the way to work, you went to Dunkin' Donuts and ordered it black or light and sweet. That was about it. Today, the coffee market is anything but simple. At the 8,000-plus Starbucks stores across the country, there are more than 87,000 possible combinations. But all customers care about is that they can get coffee exactly the way they want it. Starbucks takes something that is complex behind the scenes and makes it incredibly simple for the customer. And that is our challenge today with simplexity. Technology is the biggest driver of this issue, as it's exposing us to a world that is 24/7, 365 days of the year. It's not surprising that sleep deprivation is on the rise, and personal down-time has become the highest form of luxury. But, we at Ford believe, this is our problem. Not the consumer's. To grow and prosper in today's environment, like Starbucks, we have to reconcile more products – with more features and more complexity – but present them to the consumer in a simpler manner. Take the fact that, within our industry, there will be at least 45 new car, truck and SUV nameplates by the end of the decade, bringing the count to nearly 350. That's a 50 percent increase in only seven years with a total market that is relatively flat. The bottom line is we have more mouths fighting for the same size pie. Added to that is the fact that we as automakers are inundating consumers with more and more messages about all of those new products. Ford and its dealers alone broadcast up to 60,000 commercials on TV and cable every single day in the U.S. Which brings me to my final point, and that's the incredible and increasing importance of strong brands – with clear messages and absolute clarity to cut through the clutter. Today, I see a few, but not many, auto companies that have as sure a sense of themselves as Starbucks or Apple. And that needs to change. I can say from personal experience that Mazda has gone from a company that had no sense of itself or any brand clarity a decade ago to one today that knows exactly what its brand is all about. And look at the results. The Mazda showroom is today the strongest in its history, thanks to a laser-like focus on delivering driving performance, standout styling and exceptional value. The reward has been the best January sales performance in 13 years and record profits. For me, my challenge is to lead the Ford America's team to a similar transformation, and that's the journey we started a year ago. When we talk about simplexity, the Ford brand is incredibly complex. We sell everything from fuel-sipping Escape hybrids to 500-horsepower Mustangs, F-450 dualie pickups and family sedans. Last year, as we developed our "Way Forward" plan, we found the thread to sew our brand together. It's called "Bold Moves." It goes beyond simple demographics and describes how our customers live their lives and how we design and build safe, reliable, high-quality vehicles expressly for them. But it's also a litmus test for how we behave as a company. Are we bold? Are we confident? Are we seizing opportunities when we see them? Are we fixing problems quickly when they arise? Are we truly doing what's best for our customers? Increasingly, you're seeing more evidence that "Bold Moves" is not just a tagline. It's the standard we live up to. We know that the Ford Five Hundred is a very good car. It has high customer satisfaction and an excellent quality and safety reputation. Five Hundred is today a Consumer Reports "Recommended Buy," and our own quality numbers show it does very well against the Toyota Avalon, its closest competitor. The same can be said for the Mercury Montego and the Ford Freestyle. We're proud of the fact that 70 percent of all customers who test drive a Freestyle end up buying one. That's an amazing closing rate – best in class – and the figure is nearly as strong for the Five Hundred and Montego. Later this morning, we're going to introduce new 2008 models of all three vehicles. They are better in literally hundreds of ways. They have more design appeal, they're faster, quieter, smoother and safer. But, with all of these improvements, our team was reluctant to commit to increased sales for these vehicles this year. Why? Because, the truth is, only four in 10 people are aware that there's a car called the Ford Five Hundred. And the numbers are even lower for the Ford Freestyle and the Mercury Montego. Clearly, something is wrong. And, if we're honest, we at Ford have failed the "simplexity" test. Twenty years ago, we created and nourished a strong nameplate that consistently delivered on customer expectations. As the years passed, we created a newer, better product for the same customer, but we walked away from the equity in the name we had built over time. You've probably guessed what I'm talking about. It's the Ford Taurus. The Taurus name today is still recognized by 80 percent of consumers. In fact, it's the third strongest nameplate in the Ford lineup, behind the F-Series and Mustang. Sure, as we're introducing the upgraded 2008-model Ford Five Hundred, we could have ramped up our advertising and hoped to achieve similar awareness to Taurus. But that would take time and even more money to get the wheel turning. We believe it takes more than two years of consistent marketing and literally hundreds of millions of dollars for brand awareness to reach appropriate levels. Frankly, that strategy will not work for us. So, we're making another bold move. I am happy to confirm that the Ford Taurus and the Mercury Sable are returning to the Ford Motor Company family, and their home is again on South Torrence Avenue, right here in Chicago. When the upgraded 2008 model year products launch this summer, the Ford Five Hundred will become the new Ford Taurus. With all of the upgrades we've made, this vehicle has earned the right to be called a Taurus. In addition, the Freestyle will become the Taurus X crossover. And the Mercury Montego will become the Mercury Sable. Honestly, we never should have walked away from the tremendous equity we built in the Taurus and Sable names. We built nearly 7 million Tauruses in 20 years, and more than 3-and-a-half million of these cars are still on the road today. And I know these owners will welcome us back because they've been telling us so in their letters, their e-mails and their comments at our dealerships. Cisco Codina will have much more to say about all of these new products during our press conference at 10.45. In the meantime, in closing, I'd like to tie all of this together. As I said when we started, our customers are changing at a pace that is unprecedented within this industry. Our old fascination with simple demographics no longer fits. The successful companies, inside and outside of our industry, are the ones that are looking deeper and creating products that appeal to multiple segments. They are the companies, like Apple, Starbucks and Mazda, which are mastering "simplexity"– focusing on their brands with a clear and consistent message. They are the companies that are simplifying life for their customers. In short, winning companies are the ones embracing "more products that people want." And, at Ford, that's exactly the path we're on.